I just got a summons for jury duty. "Uncle Sam Wants You!" is what they are saying. It makes me want to don a Rosie the Riveter kerchief on my head and do a salute. And listen to the Andrew Sisters Boogie Woogie Bugle Boy. I love that song. My mom always said that as a citizen it is not just a duty, but a privilege to serve on a jury. She is a naturalized citizen, and has an appreciation for these sorts of things. She said every citizen should serve at least once. And I agree. However, I didn't always agree. I spent my 20's dodging jury duty in California. I say "dodging" because I am picturing the State of California throwing a red dodge ball at me. And of course when you are playing dodge ball the whole point of it is to not get hit. So being a rule follower, I played a spirited game of dodge ball with the State. Being a gracious winner, I am not rubbing it in their face that they lost. Time for Fine Linen and Purple's weekly link up! This week I decided to get a little edgy by doing something I usually wouldn't dream of: wearing a non-matching cardigan. I have seen bright pink with navy before, though I do not remember where. For all I know it was on a celebrity Worst Dressed List. So this might totally backfire. All I ask is that you please be gentle with me. This is way out of my comfort zone. And I am still pre-makeup, don't judge. The dress was found on consignment on the cheap. 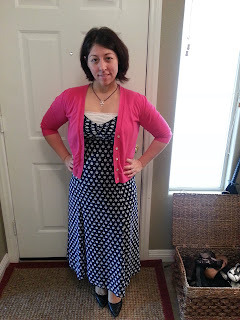 It is a brand called Joanna Hope, pink cardigan is Gap, and shoes are Kenneth Cole. This jacket is favorite of mine because not only is it adorbs, it was very expensive but I chanced to find it off-season on a steep discount and I paid beans for it. Like, it was practically free. Since our family has been growing larger I have been getting increasing pressure from family and friends to shop at Costco. Everyone wants me to go there. And they aren't shy about getting their Coscto-lovin' feelings across to me. I literally cannot get through an entire visit with my mom without the topic of Costco coming up. Usually, she tries to get me to take a trip there with her by insisting there is something there that she really, really needs. Even though she is only in town for 48 hours. And I always find an excuse of why I cannot possibly go, or why my pantry and toilet paper is completely stocked to capacity. There, I said it. Before you delete my blog out of your favorites (my blog is in your favorites, isn't it??) let me tell you why I despise it so.